MFAC was elated to be recognized for a second year in a row at the 15th annual Mutual Fund Industry Awards Gala hosted by Institutional Investors News on March 6th at The Pierre Hotel in New York City. MFAC raised over $130,000 for cancer research. With over 500 industry luminaries in attendance at the elegant Pierre Hotel, EVP of State Street Corp., and Mutual Funds Against Cancer Board Member Doug Miller opened the ceremony with charisma and political humor. He concluded his address with an introduction of Mutual Funds Against Cancer’s Founder and Chairman, Frank Strauss. Strauss addressed his peers and presented a speech that called upon the mutual fund and financial industry as |a powerful and affluent industry| that can make a difference on the war against cancer. The evening was filled with awards honoring those in the mutual fund industry along with recognizing lifetime achievers. (For all winners click here.) During the evening MFAC held a live auction with professional auctioneer John Terrio who |wooed and wowed| the audience with spectacular items including; a National Geographic 15-Day Journey aboard |The Endeavor| won by John Hailer of Natixis, luxurious jewelry, and trips to Key Largo and Spain. The auction generated over $66,000. Congratulations to all the winners. But the pinnacle of the evening was from John Canning from BHR Fund Advisors, L.P. who was the recipient of a 105th Anniversary Classic Harley-Davidson motorcycle as part of MFAC's donation program. Upon winning, John took center stage to |Born to Be Wild| and addressed the audience with a heartfelt thank you as he recently has been affected by cancer with the illness of both his parents. MFAC had an extraordinary night with its donation program raising over $66,0000. MFAC would like to thank all those who participated, donated generously and more importantly, invested in the cure. 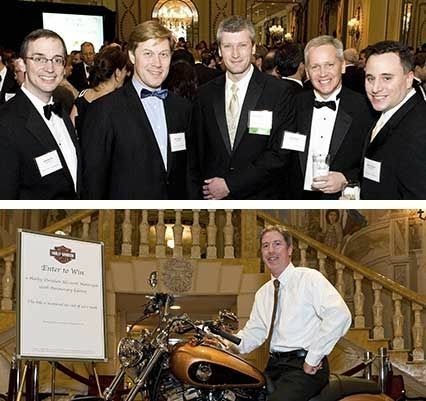 For now we will be planning next year as we have been asked to return to the highly acclaimed Mutual Fund Awards Gala in 2009. See you soon.